The BCRF has begun a tedious and time consuming project using diver deployed, underwater radiolocation �pingers� to provide surface reference of the underwater passages between Ralph�s and Dan�s Cave on Abaco Island here in the Bahamas. <?xml:namespace prefix = o ns = "urn:schemas-microsoft-com:office:office" /> Nancy Albury and Brian Kakuk were trained how to use this important technology by it�s designer Ken Smith from Australia while he was here diving with Bahamas Underground last May. Ken has donated this equipment to the BCRF for our efforts to prove the underground �footprint� of the extensive and beautiful inland blue holes. How does it work? Specially designed underwater self leveling radiolocation transmitters housed in 2 inch PVC pipe, are placed at specific sites in the ceiling of the underwater cave. Depths of each pinger are cataloged as well as their distance from the entrance of the cave. 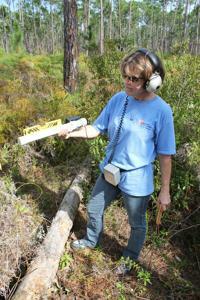 On the surface, the pingers are tracked through the thick Bahamian bush and pinelands (and poisonwood!) using a specially designed receiver. As each pinger has it�s own frequency and as they are located, GPS coordinates are taken directly over the target site and cataloged. The goal of this project is to create an interpretive trail directly over the cave passages between Dan�s Cave and Ralph�s Cave in an attempt to show the local community and tourists the beauty and significance of the labyrinth that lies directly below their feet. These efforts will also go a long way in proving to the Bahamian government the extent of these passages included in our current South Abaco Blue Holes Conservation Area proposal to protect 17 blue holes within this area. Thanks to Australian, Ken Smith for designing and donating these cave pingers to the BCRF! This equipment will greatly assist us in cave conservation here in the Bahamas. You can read more detailed information on this equipment by clicking HERE.